Last week, my bestest of friends asked me if I’d like an impromtu visit? I really don’t know why she even felt the need to ask. I told her to let me know when to pick her up from the airport, didn’t wait for an answer, proceeded to call her on repeat the way you might drunk dial an ex, and immediately ran to the grocery store to spend far, far too much money on wine, cheese, fresh flowers to fill the guest room, and an abundance of cleaning supplies. Only the best for the bestie. And she was meeting the beau. I was a little excited/nervous and even a bit annoyed about this since they are both about to be living in the same city and can be best friends without me. Jerks. Or maybe the bestie will tell the beau super romantic things to do and I don’t have to be annoyed at all. We’ll see. The evening was spent srubbing every inch of the apartment, arranging flowers, and prepping casually fancy, but very easy hors d’oeuvres. The weekend came and went, but the bestie never did. Suddenly inundated with a fresh workload, she had to cancel the trip. Ah the life of a lawyer; it made me glad not to be dating this vacation cancelling breed. I was of course bummed I’d miss her weekend of humor, sprayed myself in the eye with Windex, and gotten testy with the beau for not pulling his weight in my little vortex of madness – of which I was driven to by the overwhelming stench pervading from the bevy of lillies I’d purchased. (We threw them away promptly when they reached full bloom and we couldn’t tolerate being in the house with them). 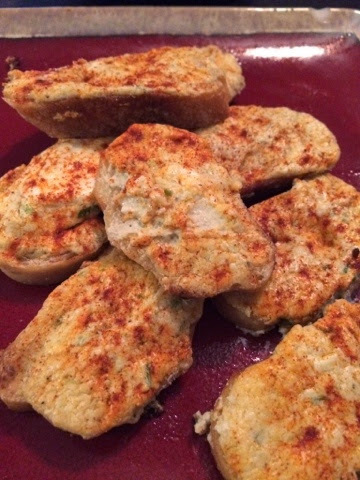 I still had my hors d’ouevres which were perfect after a Saturday of domestic errand running and a very early dinner with the beau. This probably could have fed six, but somehow the two of us managed to put an impressive dent in them. Here are some very easy, very tried and true, prep in advance hors d’oeuvres for your next entertainment flurry. Watch out for the Windex. Slice the bread into small rounds. Mix all other ingredients, except Paprika. Spread mixture on bread. At this point, you can either freeze the suckers or bake immediately. 350F for 10 minutes. Sprinkle with paprika. These are great because you can freeze a batch and bake a few at a time as needed. They pair perfectly with a full-bodied red wine. Here’s the other recipe. It’s a bit better looking. Thaw the phyllo dough. Place in a baking dish. Place brie on top of phyllo. Spread brie with apricot preserves. Melt butter over medium heat. Add pecans and brown sugar. Stir for a few minutes, until a delicious syrup forms, but don’t burn it. Pour nuts and syrup on top of brie. Wrap the sides of the phyllo up around the top of the brie like a brown bag. If you’re feeling super Betty Crocker-esque, use any excess phyllo and make cute accent shapes. Stars, hearts, flowers. The world is your oyster; don’t let this blog limit your shape ideas! 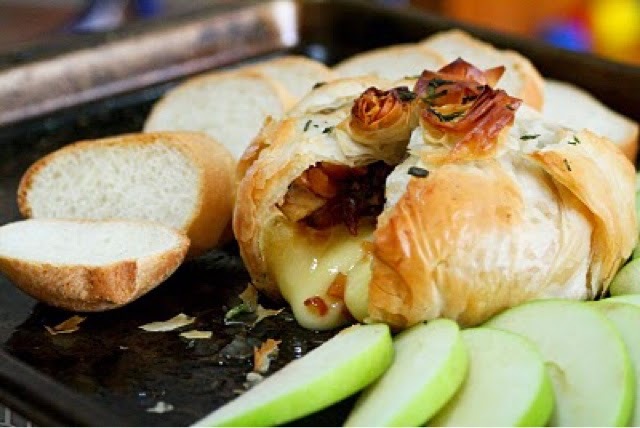 Spray brie pouch with cooking spray. Bake at 350F for 15 minutes or until brie starts to oozily melt out of the pouch. This is best served with green apple slices, but crackers and bread work too if you’re looking to up your carb intake. Devour immediately.